Mosquitoes are a real nuisance, especially in the warmer months. There are a number of different, chemical ways that you can deter these pests from buzzing around your garden. However, if you are looking for a more natural solution, then incorporating some repelling plants into your garden is a great option. How Are Some Plants Able to Repel Mosquitoes? Which Plants Are Best at Repelling Mosquitoes? Plants that have insect repelling qualities will not only make your garden look nice, but will also give off nice scents. The scent is the key factor when it comes to putting off the mosquitoes. This is because insects are typically repelled by certain smells that some plants release. Yes, the fragrant scent of lavender, basil and rosemary, to name a few, will all work wonders at getting mosquitoes out of your yard. However, not all plants with strong smells work the same way. There are a small collection of plants that are great at repelling mosquitoes. Citronella is known for its insect repelling abilities, especially when it comes to mosquitoes. There are so many citronella-based mosquito-repelling products available to buy. With that in mind, having a citronella plant in your garden will help keep the bugs at bay. Citronella works to repel insects like mosquitoes as it has a strong and powerful scent. This scent masks our human scent, making it more difficult for the mosquitoes to find us. The smell may be overpowering for mosquitoes, but its citrus-like aroma is pleasant for humans. Growing citronella in your garden is quite easy. It resembles very tall grass and typically reaches a height of around five to six feet. This plant works well in warm and temperate climates but suffers when exposed to frost. If you have cold, icy winters, then Citronella should be placed into large planters. This is so that the plants can be stored inside during the colder months. Planters with wheels will make these plants even easier to move around. When planting in your garden, be sure to position it behind smaller flowers and shrubs. This is to ensure that your smaller plants still get enough daylight and are not blocked by the larger citronella plant. This low maintenance plant can usually be found in garden centers in smaller pots. Once at home, they must be transferred to larger pots or directly into the ground, depending on your local climate. Make sure they get full sun and have well-drained soil, as waterlogging can drown them. Finally, when it comes to purchasing citronella, make sure to buy a true variety. There are some plants available on the market that are advertised as “citronella scented.” However, these plants have none of the benefits that true citronella does. When asking for true citronella, give your garden center the latin names of the plant. You are looking for Citronella Winterianus or Cymbopogon Nardus. The calming and relaxing scent of lavender can be highly offensive to mosquitoes. This makes lavender a great addition to your garden to help keep mosquitoes away. This beautiful grass-like plant with violet flowers will make an attractive addition to any backyard. As mosquitoes are repelled by the smell of this plant, it is best to position them close to where you will be sitting. With that in mind, lavender would work best as a natural yard repellent by being placed in different planters around your garden’s seating area. Lavender can also be placed near or around doors and windows to act as a barrier to prevent mosquitoes from entering the house. Lavender is most effective at repelling mosquitoes when applied directly to the skin. The best way to do this is to pick a few stems of lavender and rub it directly onto your exposed skin. The natural oils from the plant will stay on your skin and keep the mosquitoes away. When growing lavender in your garden, it is important to ensure they have well-drained soil. Waterlogged soil will kill the plants, so this is an important factor to consider, especially for the winter months. A great way to ensure your plant has good drainage is to mix some sand into the soil before planting. Lavender is best conditioned to hot and sunny climates, so try to ensure that your plants get at least eight hours of sunlight exposure a day. A sheltered spot is also preferable to protect the plant from the wind. The most resilient and easiest lavender varieties to grow are called Munstead and Hidcote. Growing basil in your garden can help to keep mosquitoes at bay in a number of different ways. The strong scent can be off-putting for these pesky bugs, but basil has another secret weapon. This delicious herb can be toxic to mosquito larvae. With that said, Basil is a great mosquito-repelling plant to have in your garden, especially if you have a pond. Growing this fragrant herb around the pond can help to prevent the mosquito population from developing in your garden. As mosquitoes lay their eggs on water, having plenty of basil around the water can keep the number of eggs laid to a minimum. There are a number of repelling compounds present in basil. All of these compounds work wonders to help keep mosquitoes at bay. Most of these compounds come into play through the scent of the plant. Not only will you be protecting yourself and your house from these unwanted visitors, but you will also have easy access to this tasty herb. Basil makes a great addition to many different dishes, so this is a great choice for those who also enjoy cooking. Growing basil in your garden is easy. This plant benefits from around seven hours of sunlight a day and well-drained soil. Basil should also be watered regularly for the best results. Be sure to keep the soil moist and never let it dry up. Catnip is a great natural mosquito repellent. Studies carried out by the State University of Iowa found that catnip can be more effective than some chemical insect repellents. While the reason for this success is still unknown, catnip is a very easy plant to grow and sustain in your garden. Catnip is a plant relative of mint and they both grow in a similar way. If left to its own devices, catnip can spread all over, just like mint. With that said, it is best to grow Catnip in individual planters instead of directly into your flower bed. Having this plant in pots is also more convenient to make the most of its repelling properties. Like most of the other plants that help to repel insects, they are more effective, the closer you are to the plant. Therefore, having catnip in different planters around the area you like to sit in the garden is a great idea. When looking for this plant at your garden center, the true Latin name is Nepeta Cateria. Like citronella, catnip grows best in full sun with well-drained soil. Regular watering is best to keep this herb flourishing. A final thought about catnip is to the cat owners out there. This herb is known to have a particularly euphoric effect on cats. Bare that in mind when it comes to the amount of this herb you plan on putting in your garden. If you are not a fan of cats, then perhaps choose a different repelling herb. With a garden full of catnip you may become a local hangout for neighborhood cats. Other plants can be just as effective at repelling mosquitoes. Rosemary is another wonderful plant that can keep the mosquitoes away. Its powerful and woody scent can deter not only mosquitoes, but also carrot flies and cabbage moths. This hardy and versatile plant is easy to grow, look after and maintain. Rosemary works best to repel insects when you are sitting in close proximity to it. It is best to position this plant in small or medium planters around doors and windows. You can also plant it into the ground near to outdoor seating areas in your garden. This herb can be used to make a natural insect repellent spray. Simply boil a quart of rosemary stems in a quart of water for 25 minutes. Strain the mixture and allow to cool before transferring to a spray bottle. Keep this spray in the fridge until ready to use. To use, simply spray directly onto your skin when outdoors. The spray is best when used within a few days of making, and needs to be discarded when there is no longer a clear rosemary scent. If you live in a hot and dry climate, rosemary is a great addition to the garden. This fragrant herb does not bode well in cold frosty climates. If you experience cold and frosty winters, it is best to keep it in planters that can be moved indoors. For those living in a temperate climate all year round, rosemary can work very well as part of a flower bed. It can be pruned into various shapes and sizes. This makes them a great option for bordering or decorating parts of your garden. Rosemary can reach a height of up to four feet, so consider this when choosing a location in your garden. Ensure that it has well-drained soil and is exposed to a lot of sunlight throughout the day. This attractive and ornamental border plant is another great insect repellent. As with the other plants listed, marigolds have a distinct smell that is offensive to mosquitoes. In addition to mosquitoes, the smell is also disliked by some people. Before you purchase some marigolds for your garden, make sure to have a smell. If you do not like the distinctive scent either, then it is best to try a different plant. However, if you are not put off, these attractive golden flowers will make a lovely addition to any garden. Another insect-repelling quality of this plant is a compound called pyrethrum. This is an ingredient used in many insect repellent products. Marigolds naturally contain pyrethrum, providing another level of defense against mosquitoes. Planting and looking after marigolds is relatively easy. They do best in full sunlight and with fertile soil. However, in order to enjoy these golden flowers every year, they must be deadheaded and thinned out to promote regrowth. You may choose to keep your marigolds in small planters along your window ledge. The smell may be enough to prevent mosquitoes from entering into the house. With that said though, the beautiful flowers of this plant can attract bees and wasps. All of our suggestions work best within a close proximity range. If you have all of these plants on the opposite side of the garden to where you are sitting, you may not notice any benefits. Other factors can also affect a plant’s ability to effectively repel insects. If there is a breeze or some wind, then your insect-repelling plants may not be as effective. The wind can blow the scent of the plants away and take away its impact completely. Plants can work as a great support in the garden to keep the mosquito population at bay. However, they will not eradicate these pests completely. 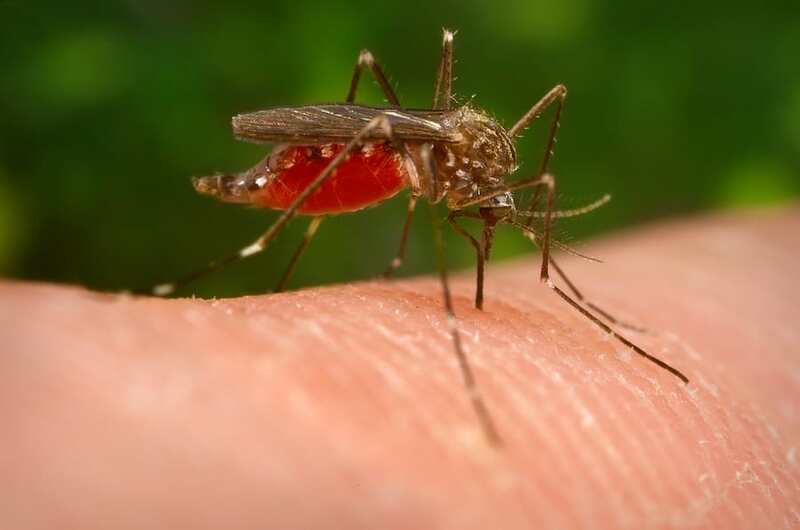 It is best not to depend solely on plants to keep your garden and home mosquito free. Also, consider that many of the plants suggested above can also repel or attract other insects. Any flowering plant in your garden will be a welcome home to bees and butterflies. This is great for pollination and your overall garden environment. Mosquito-repelling plants are the gift that keep on giving! The plants above work as other natural forms of mosquito repellents, but in different forms. You can purchase mosquito-repelling essential oils of the same plants listed above and burn them, to make another great natural repellent. Burning incense in the same scent will also help to keep mosquitoes away. You should also consider the clothing you are wearing when trying to protect yourself from mosquitoes. The more skin you cover, the less they have to bite. Be sure to consider your feet as well, and wear closed shoes for extra protection. Using plants as a natural barrier against mosquitoes is great in a number of ways. Not only are you avoiding the use of harmful chemicals, but you are making your garden look beautiful, too. For the optimal effect, we recommend planting a variety of the above plants around your house and garden. However, make sure you are considering the individual plant’s needs when choosing a location. This will ensure the best growth and condition of each plant. Check the amount of light and water each plant needs to get the most out of it.